7. Reflect on your plan at the weekend. Now I will talk some more about them. The first step in creating your own table is to create a list of tasks that you need to do on a regular basis. For example, in my table the tasks are: PhD research, conferences and publications etc. Coming up with a list of activities you are doing can have some advantages. By creating a list, you can see what tasks need your regular attention within a certain period of time. Also, putting those tasks in the time plan will help you focus better and maximise time. I remember when I first started my PhD, I ended up having one week of focused study and then a two-week gap before I studied again. This caused some problems for me. I spent longer time on my notes to remember what I had studied. This also meant I kept losing track of my progress in each task and doing my project in a non-cohesive manner. After creating your list, you then need to prioritise it. Set the time you want to dedicate to each task. Once you have done that, you put your tasks into the table on the right hand column. You can label the tasks column based on the activities you do during a week. After putting the tasks in your time plan you then need to set a target time you want to spend on this task during the week. For example, in my table I put 15-20 hours for my PhD research. For me, this includes reading for my literature review and designing my pilot questionnaire. Once you know your target time, you then need to keep a record of your progress. Jot down the time you spend on the task on the cell allocated to each day. 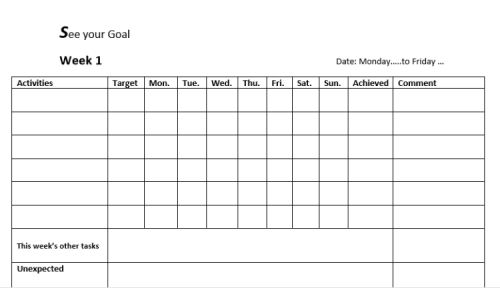 In this way you can track your study routine throughout a week. Also, you can see which days are best for you to do certain tasks. At the end of each week, you can add up the number of hours you spend on each task to have an full view of your performance on every individual task. I tend to include the weekend in my time plan. If I fail to achieve my targets for understandable reason, then I have to make up for it at the weekend. So, it is a good incentive to try to have a free weekend! In addition to the main tasks you monitor in a week, there might be other tasks which you may need to do during some weeks. They could be attending a conference, a seminar etc. Thus, you need to have these activities in mind when you are planning any particular week. This might affect the number of hours you are allocating to each task. There is a section in the table called ‘this week’s other tasks’. You can use this section to list other tasks that you need to do in that week. This helps you set more realistic targets. Also, I added two columns to the end of my time plan for “distracting activities” which may not appear that time-consuming. Once I started keeping a record of them I realized how much time I could easily waste on these activities. For me one of these was spending too much time on internet window shopping and Facebook! At the end of each week you can reflect on the positive points or points you need to reconsider in your plan. Finally, leave suggestions for next week’s better performance. I hope the SUCCESS plan can also help you in managing your time while you are doing your postgraduate studies.